An interesting gray colored tetraedrite crystal, rich in irregularly developed faces, on barite crystals and quartz crystals. 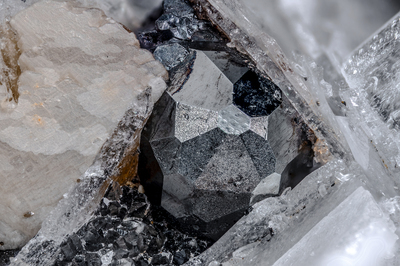 Above, to the left of the tennantite-tetrahedrite series crystal, small octahedral cubes of galena. Collection and photo of Gianfranco Ciccolini. Nikon D750, bellows, Luminar 40 mm.